A view of a cave on Bull Foot Creek taken from the south overlooking the Bull Foot Valley. 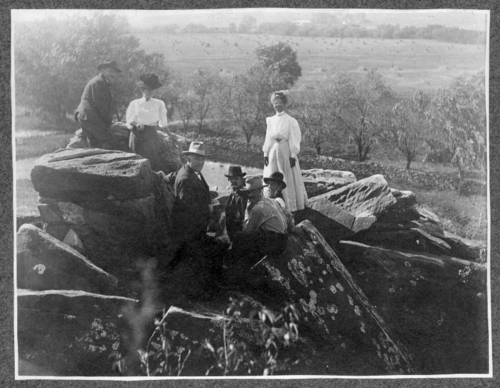 Five men and two women are seen near the entrance of the cave and are identified (in no particular order) as: Mr. Odgen Green, Mrs. J.A. Stanley, Mr J.A. Stanley., superintendent and historian, Mr. Ferdinand Erhardt, Mr. George W. Martin, Miss Clarmda Green, and Mrs. Charles Stiles.